At Campsite Le Saint Nicolas in Névez (Finistère) camping costs as little as €17,- per night during low season with CampingCard ACSI. At one of the 161 touring pitches you will get a discounted rate during the period 01-05-2018 - 07-07-2018 and 25-08-2018 - 15-09-2018. At this campsite you can not only use your CampingCard ACSI for inexpensive camping, you can also use your ACSI Club ID (as an alternative ID). 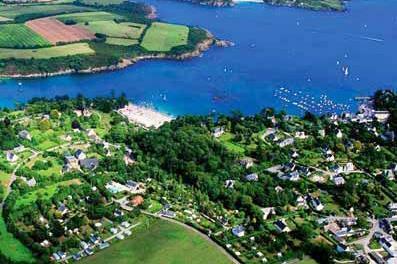 A lovely peaceful campsite within walking distance of the beach and harbour. A small shop (300m) sells fresh bread daily. 3 km from a beautifully restored Breton village. Numerous trips out possible. Indoor heated pool open all season. Outdoor pool open and heated from July. Would you like to book Côté Ô Port Manec'h - Camping Le Saint Nicolas or request more information? You can do both using the information below. From Lorient, take N165/E60 dir. Quimper, exit Kerampaou via the D24 to Névez, then dir. Port-Manech. Do not follow SatNav. On entering Port-Manech follow signs to the left. CampingCard ACSI will send your information request to "Côté Ô Port Manec'h - Camping Le Saint Nicolas".